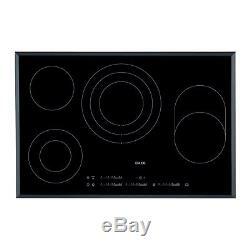 AEG HK854080FB 80cm Touch Control Ceramic Hob in Black Glass HK854080FB. It adds an element of style to your kitchen with its sleek appearance. Accurately adjust the power levels to suit your dish - there are 15 levels to choose from. Direktouch controls - swipe your finger along the slider to choose your settings. A programmable timer gives you precise cooking, even reducing the amount of energy used. Variable triple and double zones help you to match your pan size. Spacious, convenient and full of features to help you cook items perfectly, this AEG Multiple-Zone Hob is ideal for any home. Featuring four zones, including three variable, this hob is perfect for cooking with pots and pans of all shapes and sizes, giving you even heat for each dish, sauce or anything else you may be preparing. The central zone has a triple ring design and features Hilight technology, giving you the ability to adapt it to suit small, medium and large pans. There's also a Hilight double zone and single rear zone while the right-hand zone can be extended to suit larger and longer shaped pots and pans such as griddles. By adjusting the zone size to suit your cookware, you reduce the amount of heat and energy lost around its edges. Select the Automax function and the zone will operate at the highest setting to begin with, reducing to the pre-set level and therefore helping to heat your pan quicker and reducing cooking times. Stop & Go gives you the ability to "pause" your cooking, reducing the heat level of each ring to "Keep Warm" while you're away and returning to your pre-set settings when you return. The controls are all within easy, quick and safer reach, giving you intuitive and accurate operation. With 15 power levels to choose from, it's easy to find the perfect settings for your dish. They're Direktouch too, which means you can select and adjust your settings by simply sliding your finger along the scale. Set the built in Öko Timer and as it nears your set time, the hob will use residual heat to finish cooking your dish, reducing the amount of energy used overall. Ceramic and without any raised dials or controls, this hob is extremely easy to clean - simply wipe away any spills and splashes after each use. Residual heat indicators remain lit while the hob is still hot, so you're less likely to burn yourself as you clean. Auto safety shut off: Yes. Dimensions: W 780 x D 520mm. Cut-out dimensions: H 50 x W 750 x D 490mm. Ceramic cooking - quick to heat up. Precise temperature control with 15 power levels. Programmable timer, alerts you or switches off after a set time. Triple ring and double ring zones suit pots and pans of all sizes. Residual heat indicators for safety. Child lock ensures controls can't be tampered with. Öko Timer uses residual heat during final cooking moments. Stop & Go reduces zones to Keep Warm if cooking is interrupted, returning to your chosen levels when you return. Cooking zone power: Left front: 700/1700W, Left rear: 1200W, Centre: 1050/1950/2700W, Right: 1500W, Front right: 1400/2200W. 6 customers have bought and rated this product, giving it an average score of. If you'd like to pay by card, please have your e-bay user ID and item number ready and call 01484 448 969 with your card details. Nearly all orders arrive on time and in good condition but occasionally goods can get lost or damaged in transit, we do our best to prevent this by working the the highest quality couriers. The item "AEG HK854080FB 80cm Touch Control Ceramic Hob in Black Glass HK854080FB" is in sale since Wednesday, October 4, 2017. This item is in the category "Home, Furniture & DIY\Appliances\Cookers, Ovens & Hobs\Hobs". The seller is "buyitdirectdiscounts" and is located in Huddersfield.